Well here we go. I must say I wasn't sure what to expect. I have been following the tour, reading folks posts, watching the YouTube videos, but still wasn't sure what to expect. The Verizon Center slowly filled and when the house lights dim there was a tremendous roar of excitement from the crowd. Then the taped sounds of the percussion from Sympathy for the Devil starting pumping through the PA and the crowd was locked in. Suddenly you could see the door open on the screen behind Charlie's drum set and the band started filing out. And bam! Get off of My Cloud blasted with a force and youthful energy that was simply stunning. I was very lucky, extremely lucky to have wonderful seats very close to the stage left, and to be with some wonderful friends to share the experience and music. The guitars were loud, crisp and full force in the mix. Mick's vocals throughout the night were strong, however, they also had trouble with his levels, particularly when there was a loud guitar part. After Get Off of My Cloud they ripped into It's Only Rock and Roll, but something happened with the intro and Keith stopped the song. He went to Mick and put his arm around him smiling and pointing at something, and good old Ronnie was continuing the riff, oblivious. Mick then said "we stopped the song! Ronnie, Ronnie, stop!" It was very fun and spontaneous. Then they started it back up from the beginning. A nice heavy version, again, with very loud guitars. That was pretty much the trend of the entire evening. Loud guitars. Which was a very refreshing surprise. Keith did a fine job. He did have a lot of moments where he would just stop playing, and pick up the riff again, but it was forgivable, and he did pretty darnn well on most the songs. Gimme Shelter seemed to have something out of sync during the intro, but they quickly found the groove and laid out a very convincing version of one of my favorite rock n' roll songs. Paint it Black also was quite beautifully performed, with a very strong and solid intro by Keith. Then a keyboard was carried out to the front of the stage and I knew we were getting Worried About You, and Mick did a fantastic job with the intro on keys and a very tastefully done falsetto. That song cooked! It smoldered like a slow cooking soul song. Ronnie and Keith played very tasteful fills, and Ronnie's solo was superb! This was one of the highlights of the evening for me. Not too many people in my section seemed to know the song, but they loved it, and the response was very strong. I must say, for the last show of the tour in the US, I was a bit disappointed by the lack of surprises, and how static it seemed. Mick Taylor was only on two songs, and there weren't any big surprises. I was quite happy, however, that there was no special guest, albeit I would have been satisfied if Buddy Guy was invited, and a bit surprised that after Buddy's DC gig he wasn't asked up to join in the celebration. The set list and show seemed to follow pretty closely to the more conservative set lists of the tour, with Worried About You and Street Fighting Man the two rarer songs of the night (and Emotional Rescue, but that seems to have been incorporated into the regular set list a while back). Street Fighting man was powerful! Keith was full on with his guitar totally cranked and he was viciously slashing the riff. It was quite thrilling and during the lead break Mick moved in close to Keith and they locked eyes and Mick gave a nod so he could break back into the verse. That was very special and intimate moment between to road warriors who have been through the ringer together. Ronnie also played a very tasteful and accurate lead. Ronnie was particularly strong during tonight's performance, and seemed to be having a ball. As he always does! Good on him. There wasn't a lot of fooling around, and he was focused on his solo spots. He did two fantastic leads on Before You Make Me Run, and a very nice lead on You Can't Always Get What You Want. 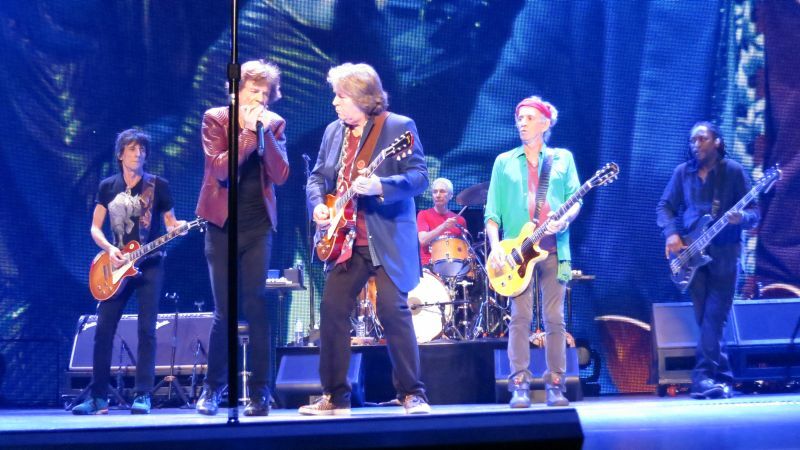 During Midnight Rambler it is very natural to lose focus on Ronnie and to follow Mick Taylor. And it was thrilling to see him. 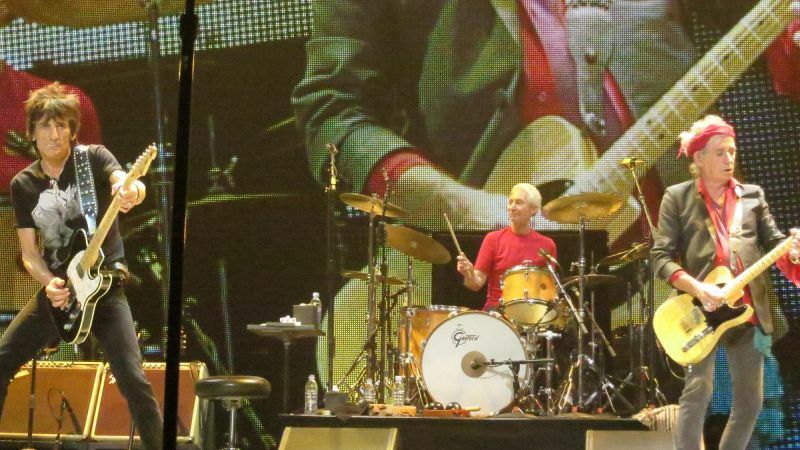 I have watched all the YouTube videos, but to be there at the concert and see him walk out to join in on Midnight Rambler was absolutely thrilling. He was fantastic and played one of the tightest and most concise versions of the tour. But again, while it is natural to focus intently on Taylor, Ronnie pulled out a wonderful lead prior to the slow blues break. Again, I was disappointed by the seemingly safe night, and that Taylor was only on two songs. And to top it off, he was playing acoustic on Satisfaction! That seemed like such a waste of his talent, and in someways was a bit embarrassing. Taylor didn't seem to happy at that point with no smiles during Satisfaction, however, him and Keith did huddle quite close during the song. I was really hoping for Can't You Hear Me Knocking, but seeing they had played it in Philly I was pretty sure DC wouldn't get it, and we didn't. 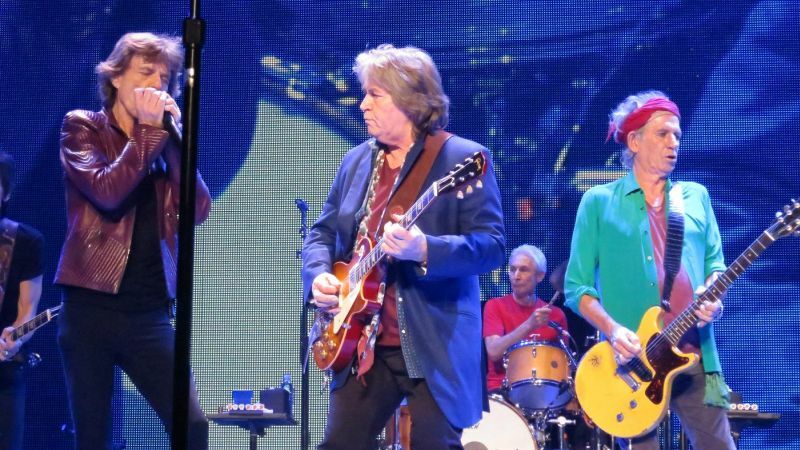 I really can't understand why, during the last show of the tour, Mick Taylor wasn't used for more than two songs. But that is The Rolling Stones, their expertise in confounding and frustrating their fans is part in parcel of following The Rolling Stones. It was quite a fun evening, and I was pleasantly surprised by how good the sound was, and how strong the show was in general. After Midnight Rambler it was the same static set list that was delivered throughout the entire tour, and the excitement waned a bit for me, and to be honest, Mick Jagger seemed to be a bit tired. He didn't put a lot of soul into his vocals for the first half of Tumbling Dice, and seemed to sing too quickly. However, at the ending coda he did do a nice soul injected play off against the "roll me..." He also sang the verses for Honky Tonk Women vey quickly as well, and seemed a bit bored by it. Which is quite ironic for the lead singer who feels the audience only wants to hear the hits. But he may be right! The audience was on its feet the entire evening, even during Keith's songs, and lots of dancing and smiles. So after all the controversy over ticket prices and the admittedly unsavory taste of the crass cash grab, and the seemingly strange and trite selection of some of the "guests" I was able to see one of my favorite bands end their 50th Anniversary tour of North America. I do count myself quite lucky and fortunate to see the show, and will say that on a whole I was very pleased by their performance. They still can rock me, because I like it! They may swing but they also thundered. Wonderful, Wonderful! Best since 69. Midnight Rambler the highlight of the evening. The last US Show in Washington was again a great Show, but did not surpass Philadelphia's outstanding 2nd concert. Down to 21 Songs again we got a good Show with "Worried About You" as a surprise song. Street Fighting Man the Vote song was very well played. With no Special guest tonight other than Mick Taylor I admit that I was expecting an additional song with Taylor. My Feeling was that they again tried to hurry up to leave the US ground early to get prepared for Saturday's Show at Glastonbury. All in all we received wonderful great Shows in the US with lots of different interesting guests. Keith - confident, playing well, leading, kicking, smiling - relaxed and enjoying himself. Back where he belongs I guess. The lay off between tours was clearly too long but now he is back performing like I haven't seen for 10 years or more? Bernard - again really up for it and excellent support. So the set list - I guess if you've seen several US gigs this tour then a little static, but Worried About You was a nice surprise (even if Mick couldn't remember the name of it). IORR, BTMMR and SFTD stood out for me - I think due to Keith's power on them. No support act - fine by me. No guest - well I think they need to be really special to cut the mustard with this year's band. Sound quality (I was section 120 near the stage) - really excellent: I look forwards to hearing a recording. Pit - looked pretty full, and lots of "back stage" passes. In summary - a great gig - full of energy and passion from the band and most of the audience. Folks had come in from far and wide (in my case England). Wow! So is this the last ever US gig - I don't think so: they enjoyed it too much - and thats what counts I think. Maybe the last in DC? who knows. I can see them on the road for another 2 months in Autumn... somewhere, it'll be good to be anywhere. Has been a warm and humid day in Washington and when I made it to the pit, temperature was rising. Showtime at 20.50. After the introduction video with all the fans and celebrities, which was slightly different than the one I've seen in London last year, the Sympathy for the devil drum started...louder and louder.....Ladies and gentlemen, please welcome: The Rolling Stones....showtime! Get off of my cloud opened the setlist followed by It's only rock 'n roll. Keith played the riff, he stopped, Ronnie started it too and then he broke it off too, some laughing and talking and then they really started the song. Love those spontanious things! No special guest tonight and just Lisa on Gimme shelter. Just Lisa?? I really forgot how amazing she can do this, what a voice! When the keyboard was carried to the from of the stage, Jagger said: I don't think that president Obama is here tonight...but im sure he's listening in... Great version of Worried About You, great falsetto, screaming Jagger...Jagger at his best. Then Street Fighting Man, first time this tour and this was Keith at his very best: guitar very loud in the mix and Keith knew that...unforgettable. First time I heard Emotional Rescue live; when the album was realeased in 1980, I never would have thought that this song would do so well as a live song but it actually did. Another hightlight was Midnight Rambler; Taylor's guitar solo came in loud...great! Amazing how this song is being built up. And this is what I really like about the 2012/2013 tour: you can hear all the guitars very well, well balanced and well in the mix. 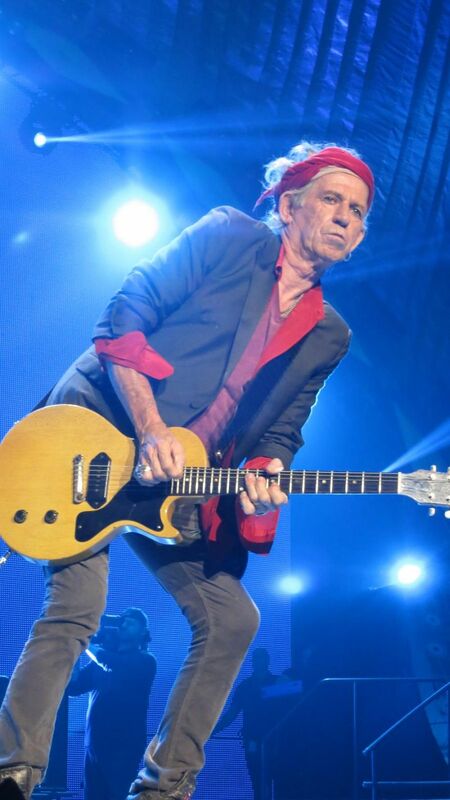 The version of Jumpin' Jack Flash is another great example of this: Keith's guitar very loud and he loves it and he knows that we do so we see him as we would like to see him: leaning over his guitar, playing his dirty riffs.....awesome! There is no way that I can fault the Rolling Stones for their performance tonight. I think they played well, but not at the level we saw in Chicago, Boston, or Philadelphia. There were a few nice song selections, specifically Worried About You and Street Fighting Man. However, the DC crowd was an absolute unresponsive dud. Anyone who has been to a great Rolling Stones show knows the loop that starts between the Stones and the crowd and how it builds. The band feeds off the energy of the crowd. It is what gets us great versions of Midnight Rambler, Mick Jagger waving his hand to extend songs, or the band simply charged up so familiar stretches of the set list are still spectacular. But Washington DC was a major downer tonight. I hate to stereotype a crowd, but people seemed so eager to sit down it was to the point of being ridiculous. Young and old alike were happy to plop their asses in the seats for Worried About You, and You Got the Silver. It was amazing how Before They Make Me Run had few people return to their feet. I sensed this was largely a local crowd, curious about the novelty of the Rolling Stones but not passionate about the music. 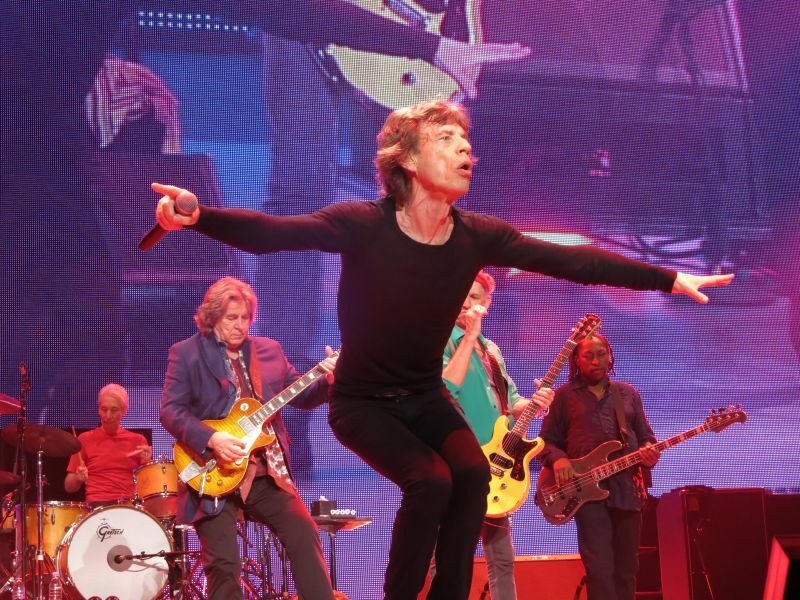 Perhaps because the show was added after the rest of the tour was announced (tickets went on sale the Monday after the Vegas show, and many items of tour merchandise do not show DC on the schedule), many quality Stones fans had already made their tour plans. The audience was lacking energy clearly being the least enthusiastic of the tour. Worried About You was excellent for those with the enthusiasm to remain standing and bouncing around. Mick Jagger's voice was strong and clear, nicely moving from falsetto to deep tones and back. Mick updated the lyrics with, "Sure going to find myself a woman (rather than girl) some day", and Ron Wood's lead was crisp and authoritative. This song was the highlight of the night. There was no mention of this being the final U.S. show by either Mick or Keith (unlike in Las Vegas in February 2003 when Keith addressed the issue). Mick Jagger did have his best quip of the year, in reference to the recent National Security Agency scandal involving surveillance on American citizens: "President Obama isn't here tonight, but I am sure he is listening in". This got the biggest laugh I had heard out of any audience on the tour. The interaction between Mick Jagger and Keith Richards was at its typical infrequent level, but during Miss You it was fun to see Keith have to tap Mick not once but twice to get his attention. It did not seem that Mick was ignoring Keith, it is just that he was too deeply in performance mode to realize that Keith was demanding his attention. The part of the song where Jagger takes off his guitar was approaching, and Keith was without a pick as both were far stage right. So Keith wanted Jagger's pick, and tapped him on the shoulder. 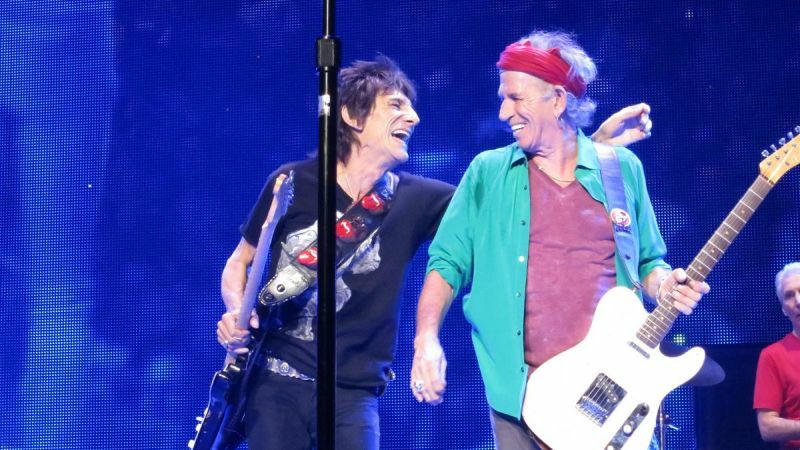 Mick went on jumping and dancing around, with Keith now smiling broadly and trying it again. Finally, success in getting Mick to share, and Miss You rolled on. 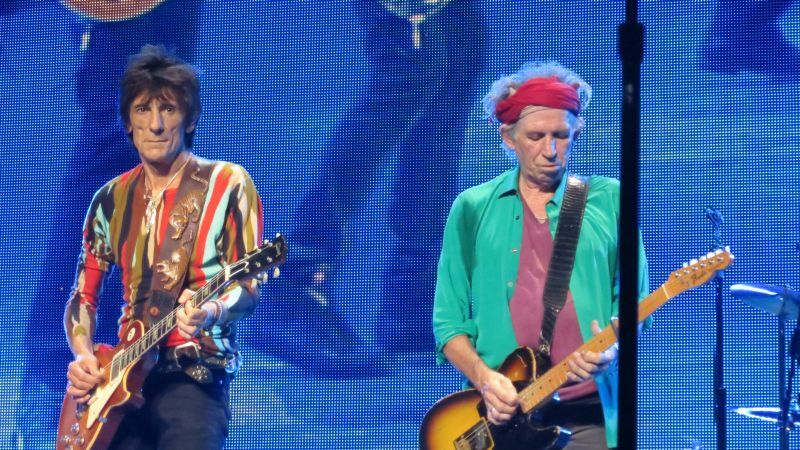 Another Mick/Keith interaction occurred under the unusual circumstance of It's Only Rock and Roll having a false start, with the song stopped after a few seconds. Keith laughed and draped his arm around Mick's neck and shoulder, while Ronnie continued playing his part softly, as if once he started he had to at least play some of it to get it out of his system. It was not clear why they had to start the song over, but this is the only time I can recall seeing the Rolling Stones have to restart a song. Sympathy for the Devil was tremendous, and has been a reliable thrill all tour. 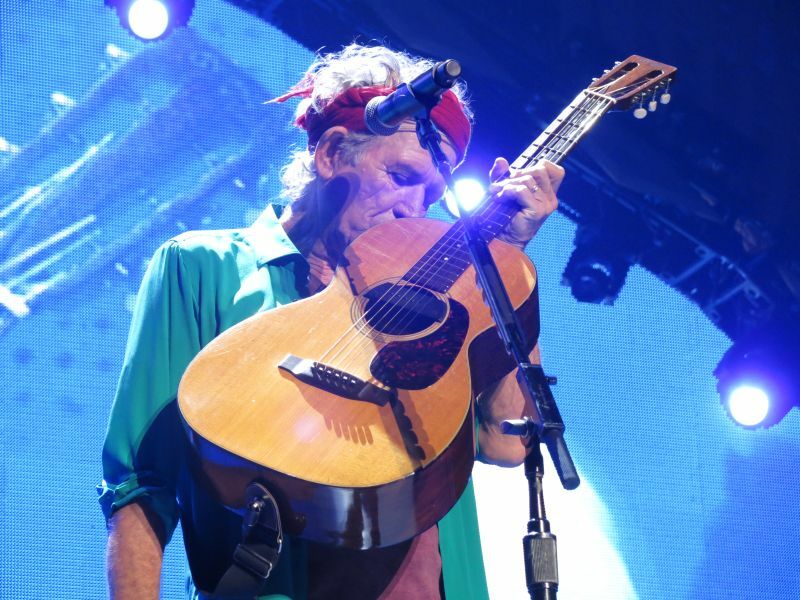 After the sparse first verse, which features just Chuck Leavell's piano and Mick gyrating in his gorilla suit (which has shown wear as the tour moves on), Keith steps out from Charlie's side and unleashes a LOUD chord that practically blows the roof off of the venue. If any other guitar player did this, one would probably say, "Man that guy is turned up way too loud! ", but Keith doing it is perfect. That immensely powerful solitary chord embodies rock 'n' roll. In keeping with the idea that a final U.S. show could have been much better, while we did not have a special guest we did not have any additional Mick Taylor either. Besides Midnight Rambler, Taylor was on stage only for Satisfaction. And this version of Satisfaction was just plain weird, with Taylor coming out with an acoustic guitar. Yes, an acoustic guitar! Strumming along with the band, relegated to Blondie Chaplin status. This was the polar opposite to Friday in Philadelphia, where Taylor owned Can't You Hear Me Knocking. Not only was this disappointing, it was downright sad. It would be easy to say Stones fans deserved better tonight, but the torpor of the DC crowd makes that a difficult argument. Let us look forward to Glastonbury and Hyde Park -- and Mick Taylor having an electric guitar! One less song than usual and about 15 minutes less than Friday night had in Philly, but another great show to wrap things up in the United States. Mick was on fire, showing even more energy throughout the show than usual, if that's possible. We got "traffic cop" Mick, especially early on, as he was waving the guys around, signaling to Chuck Lavelle and the sound crew, and seemingly aware of what everyone involved was doing or supposed to do. For whatever reason, he seemed totally immersed into the entire production last night. However, it didn't help that Mick appeared to be hit with something tossed from the crowd later in the show as he was out on the tongue. There were a few instances of feedback again, spread out during the show but otherwise the sound was superb! Musical highlights included a slightly extended version of Paint It Black as the early highlight. Lisa Fischer was tremendous on Gimme Shelter, even moreso than the other shows I saw. And then out came the keyboards to the front, so I was pretty sure we would get "Worried About You". Then Mick said "We're gonna do this one called I Wonder Why" and totally threw me for a loss, until he played the first few notes of "Worried About You". This was only my 2nd time seeing WAY live, and the first was its "comeback" performance at the Aragon in Chicago in '02. But this version totally rocked. Mick pounding out the heavy falsetto and Charlie adding some drum parts that rocked this one. Probably my #2 highlight of the evening. Next came Street Fighting Man, the supposed vote winner. A great version, but not quite up to the Voodoo Lounge tour versions. The Keith set was incredible. His You Got The Silver with Ronnie right there on guitar with him remains one of the best live spots Keith has ever brought us. And I thought this was one of the top Before They Make Me Run performances I have ever seen. And that led us to, again, my highlight of the show, Midnight Rambler. The energized Mick doing multiple harmonica spots, Mick Taylor front and center leading the way, and another "to die for" performance. After about 2 hours 15 minutes, it had to end sometime. Hopefully just for now in the United States. Here's hoping they give us One More Shot! I was stuck on the tarmac for almost 3 hours at JFK (NY), before an announcement by the pilot at 6PM that we were returning to the gate. That meant there was no way to make it to the show, but minutes later he turned to plane around and said, "We just got the all clear to go." My buddy was on our hotel's "cancel reservation" screen when the all clear came over the loudspeaker. We landed in DC at 7:30 dropped bags off at the hotel and got to the arena at 8:20. It seemed like there must be a reason for all this angst and that my 85 dollar ticket would definitely be in the pit...but alas I just missed out. Instead, getting a side stage seat in section 420, where I was able to choose between staring into a blinding spotlight or, during those moments when my vision returned, looking at the top of the myriad overhead speakers! I literally could not see the band, but hey I had a great view of the video screen! It took about four songs to maneuver and sweet talk my way into a better seat, but finally I could see the show. 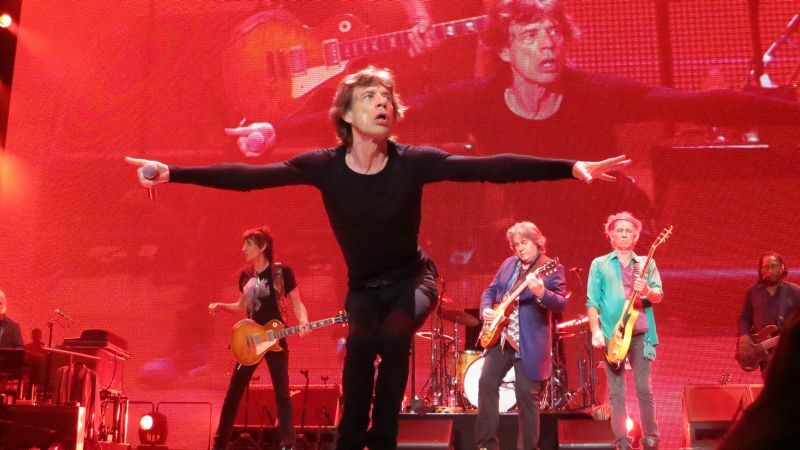 Maybe it was all the distractions of the evening, but it felt to me that the Stones were on autopilot tonight, which was disappointing for the last show (ever?). It seems like they shot their load last Friday in Philly and this was just a quick coda to the music that was their US tour. As has been stated above there was no mention of it being the last show, nor any surprises. My hope was to hear Mick Taylor play a complete version of Cant You hear Me Knocking after hearing him do only a partial one at the Iridium Jazz club last year. I thought Worried About You was excellent, but was thrown by the fact Mick called it I Wonder Why. At first I thought we were getting the old Albert King song that Mick Taylor has also done in his solo shows over the years, or maybe the Stones own I Don't Know the Reason Why, but a few chords in it was clearly neither of those. Emotional Rescue was a nice treat for me, as it marked the only new song I got tonight and gave me a nice round number of 125 for the number of different Stones songs I have heard live over the last 32 years. Mick and Keith seemed friendly throughout, though I did notice before Satisfaction, as Mick was still going back and forth with the crowd, Keith strode to the front of the stage and cut him off by starting the opening riff of the song...maybe he was reminding Mick they were in a hurry and had a plane to catch?! overall a good show, but clearly a throwaway in their minds, which was a shame if it becomes their last US show ever. If it was, I had a great run seeing 21 shows over the last 3+ decades that ranged from good to (mostly) great, so its hard to complain that this show was "only" good. Plus, the Newark show I saw last year (the non PPV one) fits nicely in the great category. So, for now, I guess its back to waiting and wondering what will be next for the Stones, as they embark on their next 50 years! Tonight was lifetime show #28 for me since July 1972 and I can say that I am a Rolling Stones fan with an extensive knowledge of their music. A was a bit less than excited since I have seen the band so many times over the years so I only laid out $170 for my ticket from the Rolling Stones VIP Ticket Office. I waited too long for the Philly shows to request tickets so they gave me seats in DC and I made the trip down from central NJ. This is the only show of this tour that I have seen and I wanted to see the last US show anyway. Let�s start with the things I really liked. 1. That main part of the stage was really simple and effective. 2. The guitars were loud, raw and sounding a bit like a garage band on steroids. 3. Overall the sound was loud and clear. 4. Ronnie Wood played the best I have heard him in ages. Moving to things I found disappointing. 1. The set list is tired and old. I think that the band was not motivated by most of the selections and on auto pilot. 2. They sounded a bit stiff tonight. All things considered I am glad I got to see them again. Mick Jagger was, as usual, on display as the best front man ever in the business. Keith was happy and relaxed and the two of them seemed to be getting on better than I have heard them to be this year. Keith�s playing was not the best tonight compared to what I have seen him exhibit but his intros were solid (except for Gimmie Shelter). He did not play his best lead guitar tonight. Charlie seemed a bit off his usual swinging self and this is where I think the stiffness came from. He rocked hard and was driving but things were just not always the best example of the greatness he brings to the role. Mick Taylor was a great addition to the show but as others have noted did not get enough time to play during the set. I think this hurts him because he has to come out cold in mid show and be on with no chance to acclimate. If they had let him work on a few more tunes he would have had a better time blending with KR and RW. I think that the three of them could have taken things further than him just showcasing on Midnight Rambler and made the event a milestone in that respect. It appears that RW really seemed to enjoy working with him. Other then the two new tunes, which were not that exciting live, the only song I never saw them perform before was Emotional Rescue. I love the tune and it brings back loads of memories like good Stones songs do but it was weak; Worried About You was much better. So am I negative? No. I really think they have a lot to deal with trying to please everyone and obviously Start Me Up is a crowd pleaser and so are the other mega hits. Maybe it was the DC crowd and maybe it was the fact that they really have not played a lot of shows on this tour as compared to the marathon tours of the past. It is what it is and I am grateful to have the music in my life. This could be the last time you know? This show being about my 85th Stones show, puts me in the amateurish category compared to most of the people that post here. I didn't think I was going to be able to visit the Stones this time around, but my Stones *habit* kept my finger on the pulse, and I was able to get to TWO shows! So glad that I did, because the atmosphere of fan gatherings, pre show excitement, and the actual show is always a bigger event, than other concerts. The Verizon center was packed, and there was Lenny Kravitz seen walking around the pit area, and on the floor. That gave the people in our section 113 the idea, that he would be the guest singer at this show, but that was not to be. The bright red tongue stage setting, the lights dimming, the opening dialog, and the burst of energy into the first song was incredible! This IS the Rolling Stones, STILL powerful, and NOT a parody of themselves that I have heard some describe. The volume, the energy of the entire band, just HITTING the stage with such power and timing is something to be seen. It is hard to describe if you have never seen them perform. They still have the stuff to supply our habit. They were able to move me that much with Get Off My Cloud! Everyone in the arena must have known why The Stones garner such a reputation just after the finish of this one song performance. Just exhilarating. The band made Cloud a live song as it was intended, not the 60's rhyming scheme single I glom over when I hear it on the radio. This is why The Stones are a band that absolutely MUST be seen live, no question are argument about that one. They sucker punch you with Cloud, and then throw no less than three big shots at you in a row, all with the same power, if not more. IORR...........Keith false start....they handled with humor...Ronnie kept playing for a moment, then restarted. Paint It Black..... Micks great vocals, and the ringing of guitars.....awesome performance. Gimme Shelter....Sound crystal clear, loud as it should be, they sounded as good as they did in the 90's. LISA!! Worried About You....Mick starts by playing keyboard, and really one of my Tattoo You favorites, a real treat personally. Street Fighting Man....Adrenaline surge again! 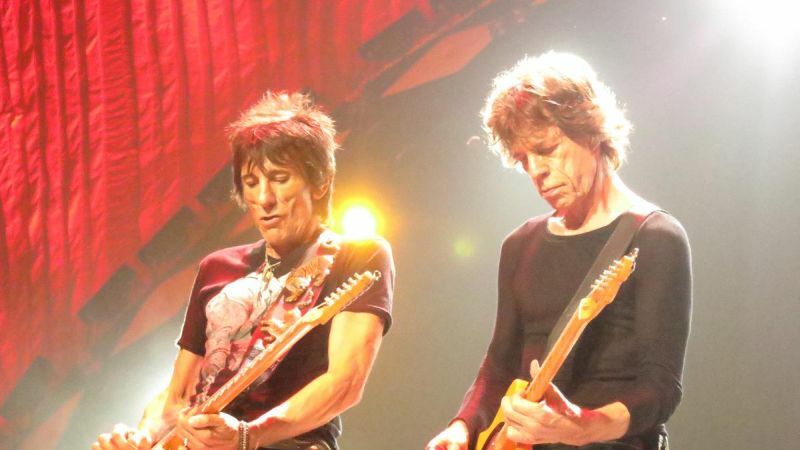 Clanging guitars, with Jagger's perfect voice...a Stones classic live. Only 6 songs in, and you know The Stones are well oiled, everyone knows their part, the band is throwing it at us. I was pleasantly surprised at the power of the production, well done! The sound was impeccable, clear and balanced. We STILL have Rambler coming....emotional performance, second time seeing Mick Taylor live, and he adds flavor to the song. We almost got Cant You Hear Me Knocking as well, but it was dropped from the set list. I have heard this was due to time constraints, which was the only downer. 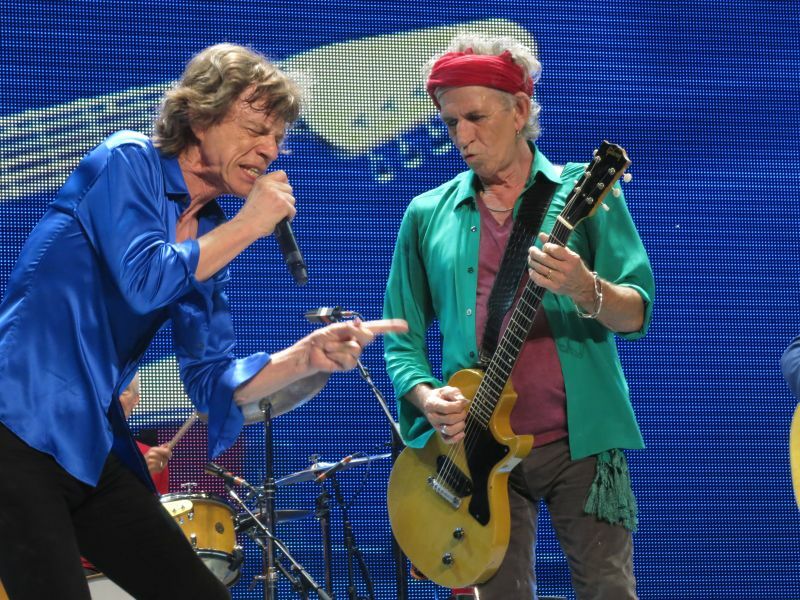 They know what they are doing, Mick is so concentrated on each song, he barely gets out of himself. It is hard to catch his eye, nearly impossible during a number. Seems like he lives each performance by ear, and emotion....an incredible live performer. The guy pours his soul into each song....to the point of almost losing himself virtually, while still tuned to every band members part. Hard to explain, but is something that has to be seen live. What surprised me the most, is Keith Richards. Dispel all the rumors you have heard. It is obvious to me that hitting his head affected his performances at the end of Bigger Bang. The guy is right one his rhythms, his leads are as good as they have ever been, and he is an integral component of the band more than ever. His energy, alertness, humor, and pleasure to be there, or anywhere are more than obvious. He gets behind the band, and plays the way he always has. 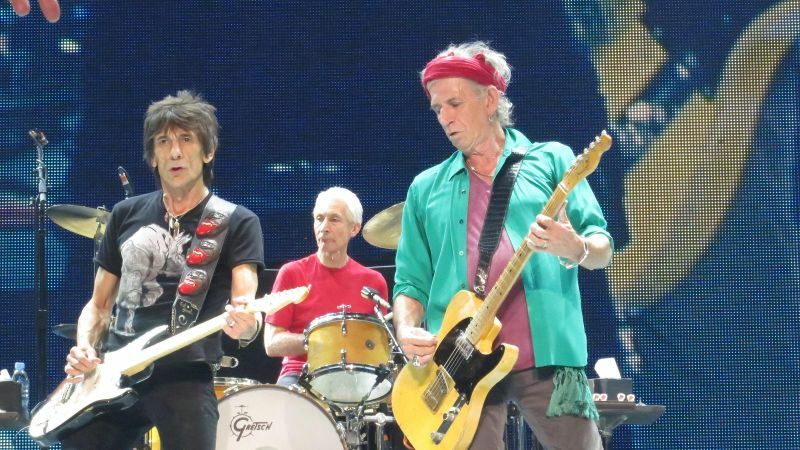 It is my opinion that Mick and Keith are doing what they love doing. Charlie grinning half the night, ear to ear, and it's obvious he loves being there as well. 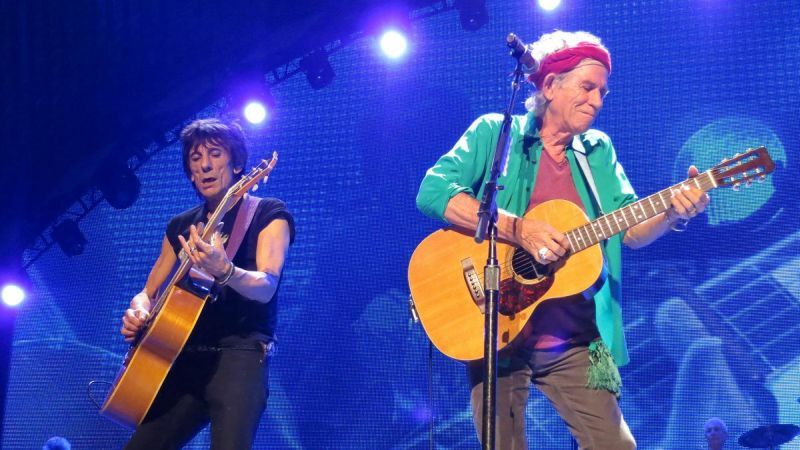 Ronnie's diverse guitar playing is awesome, always with an eye on Keith, and vice versa. They are doing the guitar weave, just as good as ever. Keith's, You Got The Silver is touching, and really a nice performance. 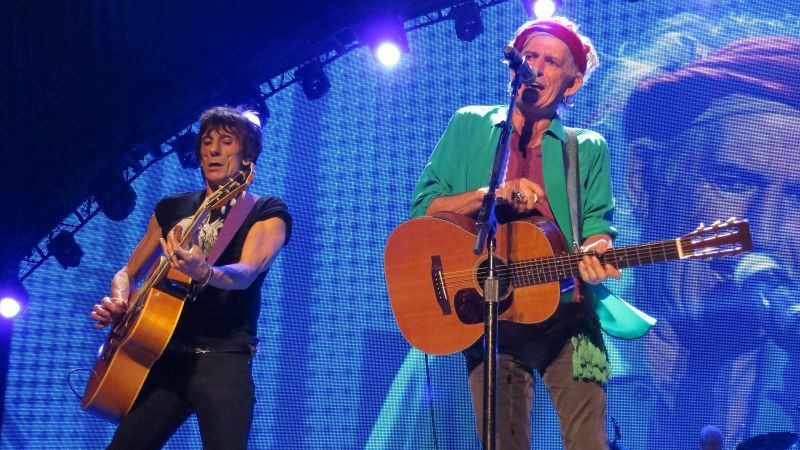 Ronnie and Keith at center stage with acoustic guitars. The band foray's into 2 new songs, and Emotional Rescue to give the setlist some texture. Thank you! The encore, is where you think The Stones are going to hit you with one, and then split. No they don't! I am so glad they decided to keep the choir for You Can't Always Get What You Want for this tour, it really hones the song to something magic for me. This song is closer to the vinyl and gives the number a real authentic feel. Really emotional to see. JJF..........all I can say is thank you on this one, what a mix of sound. A real Jagger Richards performance. Everyone was on their feet and dancing the entire show. I was sitting behind a first generation group of fans. I think that the entire crowd was very into the show, maybe not as much as the Philly 21st show. I think I got my money's worth...........and more. No let down for me. All that being said, and I apologize if it's too much, a final Rolling Stones concert for me. Which was a perfect experience from beginning to end. One show is never enough on a tour, there is always so much going on, onstage. The way the band communicates with each other....tease each other....all while giving the audience something that is still different from other performers. I hope they can capture it on CD with a live compilation somehow, it is always hard to duplicate the performance. Just put it there, no twiddling about with the overdubs MICK!